Online bidding for a wall painted on by graffiti artist Banksy has closed with a final bid of £208,100. However, neither auction site eBay nor seller Luti Fagbenle has confirmed if the bid has been accepted. The painting is on a wall on the side of a media production firm's base in Portobello Road in west London. Mr Fagbenle owns the company. The final bid does not include the cost of removal and repair of the wall, estimated to be about £5,000. The artwork is now covered in plastic and shows a painter finishing off the word "Banksy". 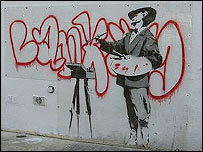 Bobby Read, art expert at specialist insurer Hiscox, said: "Banksy is a maverick as well as a hugely talented artist. It's an intoxicating combination for buyers as this price shows. "The Portobello Road wall is a special piece and probably the largest piece of Banksy art work to have been sold at a public auction. "This sale poses many interesting questions for the art world. How do you move a piece of work like this, how do you display it and how do you insure it?" Included on the auction page was a description of how Banksy managed to paint the picture without being discovered. The posting explained: "One might guess that he would come in the middle of the night but instead he got some people to put a massive scaffolding in on a Sunday morning with Portobello Market at full swing. "Even someone from my office saw it and thought nothing of it." The vendor estimates that the cost of removing the painting will be about £5,000, which would have to be paid by the buyer. There were a total of 69 bids for the painting.